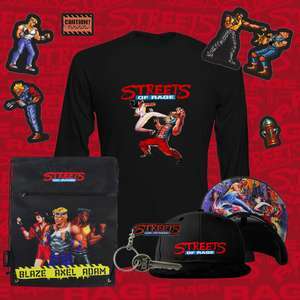 SEGA Shop has just launched a sale with up to 70% off selected products, including exclusive SEGA Shop bundles (raglan T-shirt, cap, socks, keyring and magnets) worth £55 down to £19.99. The site's run by Yellow Bulldog, which also has the Geekstore site and Numskull. I've ordered a shirt from here before - good quality, especially for the price. The wallets also last a good chunk of time, which is great because they're all of £4. £2 delivery under £50. Looks like you can get %15 off too if you sign up for their news letter. 2 t-shirts - shipping cost £7!!!!!!! Order cancelled, I don't actually need any more videogame based t-shirts. 2 t-shirts - shipping cost £7!!!!!!! Order cancelled, I don't actually …2 t-shirts - shipping cost £7!!!!!!! Order cancelled, I don't actually need any more videogame based t-shirts. Oh wow, really? I only paid £2 for a similar packet size before! both megadrive wallets, a megadrive keyring and cuflinks are £5 with £2 postage, not bad when a wallet is £5+ on amazon on it's own.